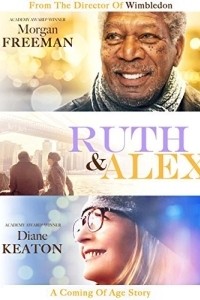 Morgan Freeman and Diane Keaton play Alex and Ruth Carver in Ruth & Alex (2014), a wistfully bland property-based dramedy that comes off as a cross between Location, Location, Location and On Golden Pond (1981). Alex is a struggling artist and Ruth is a retired teacher. Together they live in their Brooklyn apartment with their sick dog Dorothy and far too many stairs. Puffed out from all the clambering up and assured that they can get a million dollars for the place, they decide to sell up and get somewhere more manageable, pocketing the difference. With the help of Ruth’s niece Lilly (Cynthia Nixon) they are to have an open house, but at the same time they discover that their dog needs surgery. In the city a truck has been abandoned on the Williamsburg Bridge and the shadow of 9/11 is being invoked by 24 hour news as the Muslim driver is on the run. Directed by Richard Loncraine (known for Richard III and lightweight comedy Wimbledon) and adapted from Jill Ciment’s novel Heroic Measures by Charlie Peters, Ruth & Alex never quite escapes from its own self-satisfaction and a comfy predictability which will never threaten the viewer with suspense or intrigue. As each potential buyer parades through the film – the parent who doesn’t say no to her child, the mad hippy, the lesbian dog couple – it becomes increasingly apparent even the dull plot isn’t going to have any significant twists. Of course, watching veteran actors of the calibre of Freeman and Keaton acting together is something of a treat, but we also see their young selves (Korey Jackson and Claire van der Boom) in a series of misconceived flashbacks that tell us little that we couldn’t have gleaned from the characters themselves and just leads to a distracted musing about the similarities of the two sets of actors. It gives Alex and Ruth back stories when they already have history. We can see it in their faces. As affable as the leads are, Ruth & Alex is ultimately too fluffy to offer anything real. The comedy isn’t funny enough and the social commentary at times verges on the smug as Freeman ponders in voiceover the prevalence of smart phones and parents pushing buggies which cost the same as a Chrysler. “I don’t talk politics or religion in my studio,” says the young Alex, which probably explains why he never sells any paintings, and the film itself suffers from an inoffensiveness that seeks to be tasteful but ends up tasting of nothing.